The 2015 Mary Black Award was presented to Portsmouth and District’s Barbara Brailley at her local synchronised swimming club. The Mary Black Award is widely known in the British synchro community and is usually presented at the ASA National Age Groups Synchronised Swimming Championships. It is given to an individual who has provided an outstanding service to the sport. 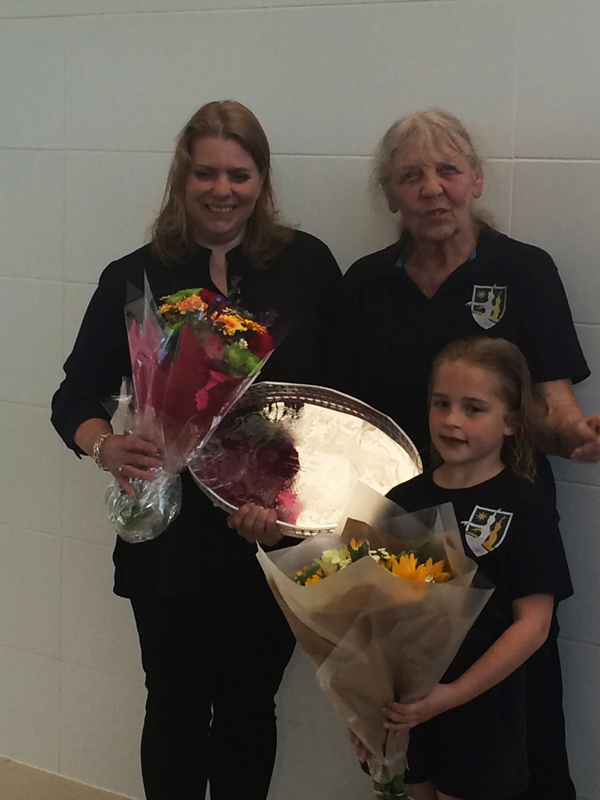 The trophy was presented at a surprise ceremony at Portsmouth and District Synchronised Swimming Club by Maria Ramos (Chair of the ASA Synchronised Swimming Leadership Team) and Ann-Sophie Shaul, who at seven years old is the club’s youngest swimmer. Barbara has been involved in synchro for more than 40 years. She has inspired thousands of young women and girls to discover and take part in the sport. In 1980, she helped to establish a new synchro club in Portsmouth. She used her knowledge as both a swimming and gymnastics coach, and her own background as a dancer. She has also spent a number of years sharing her knowledge with many other clubs on the south coast of England. These include Ferndown Flamingoes, Rushmoor, Worthing, Horsham and Portsmouth and District. Barbara has coached synchronised swimming at all levels and many of the athletes she has trained have competed at national and international competitions, including a number of Masters world champions. She is also a fully qualified synchro judge and is well known across the judges’ circuit. Maria Ramos commented on the award, “Barbara is known for being enthusiastic and inspirational. Her passion, commitment and nurturing personality has encouraged swimmers to achieve their goals. “She gives confidence and support to the parents and coaches who help to run the club.